Note: Rakuko Tane is unable to perform due to her phisical condition. Therefore, Kazuyo Mita is to take her place. There will be no performances on Monday 14, Monday 21 and Monday 28. Available from Sunday 18 March, 2001 at 10:00am. Let us cultivate the field of our memory. Ordinary People Who Got Involved in the Tokyo Trial. Inoue-Style "Heavy" Comedy is so Serious as to Provoke Laughter. The "Series of New Performances for the Pit" provides an opportunity for leading playwrights and groups of actors and actresses to present new plays on the theme of "Age and Memory." The highlight and conclusion of this series of plays, which sharply delineated various social problems, is Yume no Sakeme (A Crack of Dream), a new and long-awaited play by Hisashi Inoue. Inoue has previously published masterpieces in which he questioned the ethics of the Japanese people through the history of the common people, these works include the Showa Shomin-den (Lives of the Common People in the Showa Period) series, which depicted the joy and anger of common people who lived before and after World War II, Chichi to Kuraseba (Living with Father), which took hibakusha (survivors of the atomic explosions)as its subject matter, and Kamiyacho Sakura Hotel, which looked at the war through public entertainment. In Yume no Sakeme, Inoue -- who has used outstanding ideas and an abundant sense of humor to portray people who lived in the turbulent Showa period -- will take up the Tokyo Trial as a motif, a topic Inoue has long hoped to work with. The Tokyo Trial -- officially known as the International Military Tribunal for the Far East -- was held from May 1946 to November 1948 for the so-called class A Japanese war criminals from the Pacific War. Sentence was passed on a total of 25 war criminals, including Hideki Tojo and six others who were condemned to death by hanging. Through portrayals of a serious of difficult people, who for reasons unknown became involved in this historical trial, Yume no Sakeme tackles various themes: What the Tokyo Trial was, who the Japanese people are, and what the relationship between the people and the state is. 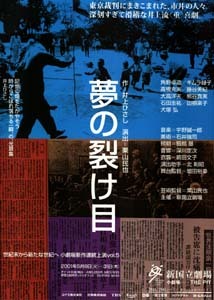 Under these themes, an interesting yet profound world, one unique to Inoue, unfolds in the course of the play. It vividly describes the lives of common people who lived in the period immediately after the war and pursues the meaning of the Tokyo Trial in the context of contemporary history. It is an Inoue-style heavy comedy, one so serious as to provoke laughter. Yume no Sakeme will be directed by Tamiya Kuriyama, Artistic Director for the Drama Division of the New National Theatre, Tokyo. The play will be performed by various actors and actresses who have an established reputation for their reliable acting abilities. It will add a new page to the history of drama.